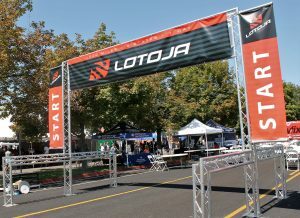 According to their website, LoToJa was started in 1983 by two Logan cyclists, David Bern, a student at USU, and Jeff Keller, the owner of Sunrise Cyclery. LoToJa’s first year featured seven cyclists racing 192 miles from Logan to a finish line in Jackson Hole, Wyoming’s town square. Since then, LoToJa has grown into one of the nation’s premier amateur cycling races and continues to be a grueling test of one’s physical and mental stamina. Cyclists and vendors crowd the block on 1st East between 2nd and 3rd North for the 206 mile LatoJa Friday. The 36th annual LoToJa ride will take place this weekend, and like the name implies, will start in Logan early Saturday morning and end in Jackson Hole. On KVNU’s For the People program on Thursday, Drew Nielsen and Greg Roper, who works for Cache Valley Media Group, were the guests. They have been participants for quite a few years now. Roper said the cycling community is a tight-knit group. “It’s a phenomenal group. I remember standing on the streets of Santa Barbara, California, crossing a road. Three or four cyclists rode up and two of them had a LoToJa jersey on. And I stopped them and said ‘Hey I’m from Logan’. Immediately there was ‘Oh really! I did (LoToJa) several years ago, I’m never going back!’ So you see the stickers, you see the jerseys, you see the material and yeah, there’s war stories with every single person that wears one of those,” he said. With about 200 miles involved in mountainous terrain, how does somebody train for something like this? Nielsen said many exercise year-round but it’s tough to ride outside in Cache Valley during certain times of the year. 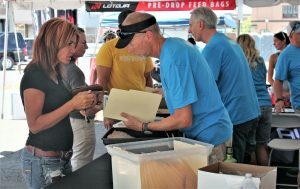 Deena Wolfley checks in with Robert Schmidt for the 36th annual Logan to Jackson bicycle race on Friday. “There’s a lot that goes on starting in the spring, but it really ramps up in July and August. That’s kind of what makes, I think, a lot of people say ‘I’m not doing this again’, because you invest so much time in those two months to get ready to ride 200 miles in a single go,” said Nielsen. Roper said the majority of the people who do the ride do it not as a race but as an accomplishment. Since the event has grown to encompass 1500 to 2000 riders, safety is paramount. Sadly, some cyclists have been injured and have even died doing the ride. Roper acknowledged that there are irresponsible riders just as there are irresponsible drivers, but he asked for the driving public’s patience when they encounter cyclists. When there is an accident, Roper said, the cyclist never wins. They can wind up in the hospital or even dead.